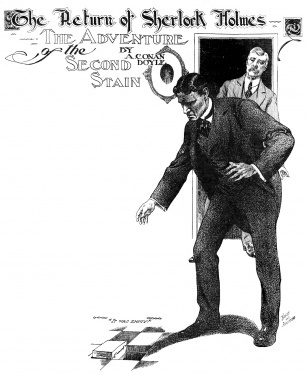 The Adventure of the Second Stain (SECO) is a short story written by Arthur Conan Doyle first published in The Strand Magazine in december 1904. This is the 40th Sherlock Holmes story. Collected in The Return of Sherlock Holmes. They sat side by side upon our paper-littered settee. The Premier sprang to his feet. No, my dear Watson, the two events are connected–must be connected. She looked back at us from the door. He took the corner of the carpet in his hand. It hinged back like the lid of a box. You–you insult me, Mr. Holmes. She seated herself with her back to the window. "There is a second stain!" 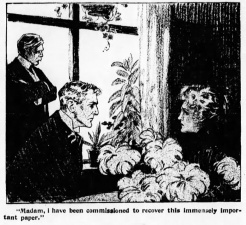 "Madam, I have been commissioned to recover this immensely important paper." 1986 : The Second Stain (UK). Holmes : Jeremy Brett. Watson : Edward Hardwicke. 1968 : The Second Stain (UK). Holmes : Peter Cushing. Watson : Nigel Stock. 1951 : The Second Stain (UK). Holmes : Alan Wheatley. 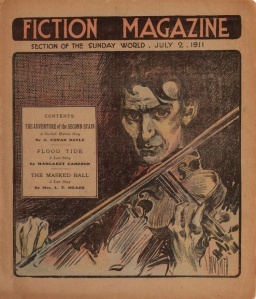 Watson : Raymond Francis. 1922 : The Second Stain (UK). Holmes : Eille Norwood. Watson : Hubert Willis. 1993 : The Second Stain. Holmes : Clive Merrison. Watson : Michael Williams. 1967 : The Second Stain. Holmes : Carleton Hobbs. Watson : Norman Shelley. 1958 : La Seconde tâche (FR). Holmes : Maurice Teynac. Watson : Pierre Mondy. 1955 : The Adventure of the Second Stain. Holmes : John Gielgud. Watson : Ralph Richardson. 1954 : The Adventure of the Second Stain. Holmes : John Gielgud. Watson : Ralph Richardson. 1942 : The Second Stain. Holmes : Basil Rathbone. Watson : Nigel Bruce. 1940 : The Second Stain. Holmes : Basil Rathbone. Watson : Nigel Bruce. 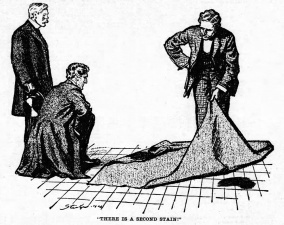 1932 : The Adventure of the Second Stain. Holmes : Richard Gordon. Watson : Leigh Lovell. Lord Bellinger, a former prime minister, and Trelawney Hope, Secretary for European Affairs, show up at Baker Street about a case they want neither the police nor the public to be aware of. A critically important letter from a foreign potentate, which Hope had been keeping in his personal safe, has disappeared. Holmes knows of three international secret agents who would be interested in obtaining this document: Oberstein, La Rothière and Eduardo Lucas. He therefore intends to question them, but learns that Lucas has been murdered in his home. Meanwhile, Lady Hilda, Hope's wife, visits Holmes and begs him to reveal to her the contents of the letter. 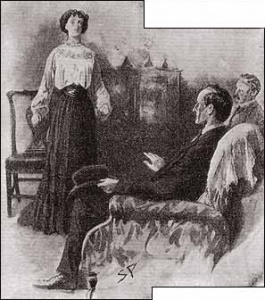 Holmes, who promised to the officials that he would keep the secret, refuses , which leaves Lady Hilda desperate. A few days later, the press reveals that Lucas lead a double life and shared his time between London and Paris, where he was called Henri Fournaye and was married to a very jealous woman. She'd been seen around Lucas's home the night he was murdered and is naturally suspected. Lestrade asks Holmes to come to Lucas's home to see something that puzzles the inspector: The blood stain on the carpet and the one on the floor don't match. 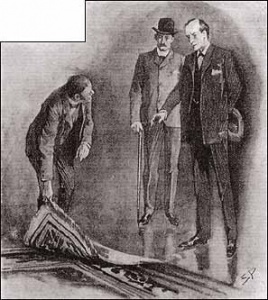 The carpet has then been turned round after the murder, which, Holmes points out, means the constable must have let someone came in the house. 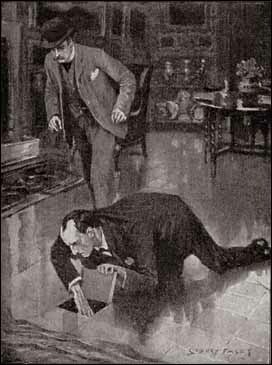 While Lestrade interviews the constable, Holmes inspects the floor and finds an empty box in a cavity under the floor. 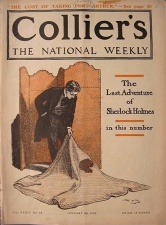 He returns it to its hiding place before Lestrade reenters the room with the constable, who confesses that he left a young woman alone a little while in the room. 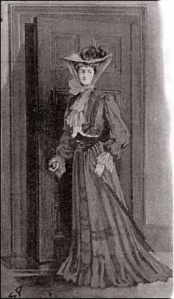 Holmes then go and see Lady Hilda and enjoins her to hand the stolen letter over to him. She bursts into tears and explains that Lucas was blackmailing her and demanded she gives him the letter he knew Hope was hiding. Owning a key to the safe, she complied, but saw where the scoundrel hid the letter. When she heard he had been murdered, she rushed to Lucas's house and tricked the constable in order to get the document back. 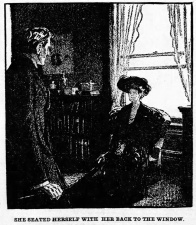 Holmes helps Lady Hilda by replacing the letter and convincing Hope that it never actually left the safe. 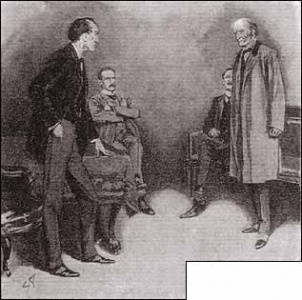 I had intended 'The Adventure of the Abbey Grange' to be the last of those exploits of my friend, Mr Sherlock Holmes, which I should ever communicate to the public. This resolution of mine was not due to any lack of material, since I have notes of many hundreds of cases to which I have never alluded, nor was it caused by any waning interest on the part of my readers in the singular personality and unique methods of this remarkable man. The real reason lay in the reluctance which Mr Holmes has shown to the continued publication of his experiences. So long as he was in actual professional practice the records of his successes were of some practical value to him; but since he has definitely retired from London and betaken himself to study and bee-farming on the Sussex Downs, notoriety has become hateful to him, and he has peremptorily requested that his wishes in this matter should be strictly observed. It was only upon my representing to him that I had given a promise that The Adventure of the Second Stain' should be published when the time was ripe, and pointed out to him that it was only appropriate that this long series of episodes should culminate in the most important international case which he has ever been called upon to handle, that I at last succeeded in obtaining his consent that a carefully guarded account of the incident should at last be laid before the public. If in telling the story I seem to be somewhat vague in certain details the public will readily understand that there is an excellent reason for my reticence. It was, then, in a year, and even in a decade, that shall be nameless, that upon one Tuesday morning in autumn we found two visitors of European fame within the walls of our humble room in Baker Street. The one, austere, high-nosed, eagle-eyed, and dominant, was none other than the illustrious Lord Bellinger, twice Premier of Britain. The other, dark, clear-cut, and elegant, hardly yet of middle age, and endowed with every beauty of body and of mind, was the Right Honourable Trelawney Hope, Secretary for European Affairs, and the most rising statesman in the country. They sat side by side upon our paper-littered settee, and it was easy to see from their worn and anxious faces that it was business of the most pressing importance which had brought them. The Premier's thin, blue-veined hands were clasped tightly over the ivory head of his umbrella, and his gaunt, ascetic face looked gloomily from Holmes to me. The European Secretary pulled nervously at his moustache and fidgeted with the seals of his watch-chain. The two statesmen exchanged a quick glance, and the Premier's shaggy eyebrows gathered in a frown. 'That is a State secret of the utmost importance, and I fear that I cannot tell you, nor do I see that it is necessary. The Premier sprang to his feet with that quick, fierce gleam of his deep-set eyes before which a Cabinet had cowered. 'I am not accustomed' he began, but mastered his anger and resumed his seat. For a minute or more we all sat in silence. Then the old statesman shrugged his shoulders. 'I agree with you, sir,' said the younger statesman. 'Yes, sir, a cipher telegram has been dispatched. Mr Trelawney Hope dropped his head on his chest and groaned aloud. The Premier placed his hand kindly upon his shoulder. When our illustrious visitors had departed, Holmes lit his pipe in silence, and sat for some time lost in the deepest thought. I had opened the morning paper and was immersed in a sensational crime which had occurred in London the night before, when my friend gave an exclamation, sprang to his feet, and laid his pipe down upon the mantel-piece. A crime of a mysterious character was committed last night at 16, Godolphin Street, one of the old-fashioned and secluded rows of eighteenth-century houses which lie between the river and the Abbey, almost in the shadow of the great tower of the Houses of Parliament. This small but select mansion has been inhabited for some years by Mr Eduardo Lucas, well known in society circles both on account of his charming personality and because he has the well-deserved reputation of being one of the best amateur tenors in the country. Mr Lucas is an unmarried man, thirty-four years of age, and his establishment consists of Mrs Pringle, an elderly housekeeper, and of Mitton, his valet. The former retires early and sleeps at the top of the house. The valet was out for the evening, visiting a friend at Hammersmith. From ten o'clock onwards Mr Lucas had the house to himself. What occurred during that time has not yet transpired, but at a quarter to twelve Police-constable Barrett, passing along Godolphin Street, observed that the door of No. 16 was ajar. He knocked, but received no answer. Perceiving a light in the front room he advanced into the house and again knocked, but without reply. He then pushed open the door and entered. The room was in a state of wild disorder, the furniture being all swept to one side, and one chair lying on its back in the centre. Beside this chair, and still grasping one of its legs, lay the unfortunate tenant of the house. He had been stabbed to the heart, and must have died instantly. The knife with which the crime had been committed was a curved Indian dagger, plucked down from a trophy of Oriental arms which adorned one of the walls. Robbery does not appear to have been the motive of the crime, for there had been no attempt to remove the valuable contents of the room. Mr Eduardo Lucas was so well known and popular that his violent and mysterious fate will arouse painful interest and intense sympathy in a widespread circle of friends. 'Well, Watson, what do you make of this?' asked Holmes, after a long pause. Mrs Hudson had appeared with a lady's card upon her salver. Holmes glanced at it, raised his eyebrows, and handed it over to me. 'Ask Lady Hilda Trelawney Hope if she will be kind enough to step up,' said he. A moment later our modest apartment, already so distinguished that morning, was further honoured by the entrance of the most lovely woman in London. I had often heard of the beauty of the youngest daughter of the Duke of Belminster, but no description of it, and no contemplation of colourless photographs, had prepared me for the subtle, delicate charm and the beautiful colouring of that exquisite head. And yet as we saw it that autumn morning it was not its beauty which would be the first thing to impress the observer. The cheek was lovely, but it was paled with emotion; the eyes were bright, but it was the brightness of fever; the sensitive mouth was tight and drawn in an effort after self-command. Terror - not beauty - was what sprang first to the eye as our fair visitor stood framed for an instant in the open door. 'Mr Holmes, I implore you not to tell him that I came here.' Holmes bowed coldly and motioned the lady to a chair. She swept across the room and seated herself with her back to the window. It was a queenly presence - tall, graceful, and intensely womanly. 'Ah!' She drew in her breath sharply as one whose doubts are resolved. 'Then I will take up no more of your time. I cannot blame you, Mr Holmes, for having refused to speak more freely, and you on your side will not, I am sure, think the worse of me because I desire, even against his will, to share my husband's anxieties. Once more I beg that you will say nothing of my visit.' She looked back at us from the door, and I had a last impression of that beautiful, haunted face, the startled eyes, and the drawn mouth. Then she was gone. All that day and the next and the next Holmes was in a mood which his friends would call taciturn, and others morose. He ran out and ran in, smoked incessantly, played snatches on his violin, sank into reveries, devoured sandwiches at irregular hours, and hardly answered the casual questions which I put to him. It was evident to me that things were not going well with him or his quest. He would say nothing of the case, and it was from the papers that I learned the particulars of the inquest and the arrest with the subsequent release of John Mitton, the valet of the deceased. The corner's jury brought in the obvious 'Wilful murder', but the parties remained as unknown as ever. No motive was suggested. The room was full of articles of value but none had been taken. The dead man's papers had not been tampered with. They were carefully examined, and showed that he was a keen student of international politics, an indefatigable gossip, a remarkable linguist, and an untiring letter-writer. He had been on intimate terms with the leading politicians of several countries. But nothing sensational was discovered among the documents which filled his drawers. As to his relations with women, they appeared to have been promiscuous but superficial. He had many acquaintances among them, but few friends, and no one whom he loved. His habits were regular, his conduct inoffensive. His death was an absolute mystery, and likely to remain so. As to the arrest of John Mitton, the valet, it was a counsel of despair as an alternative to absolute inaction. But no case could be sustained against him. He had visited friends in Hammersmith that night. The alibi was complete. 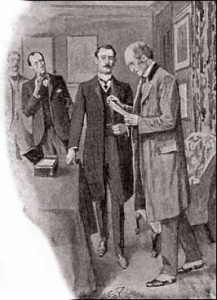 It is true that he started home at an hour which should have brought him to Westminster before the time when the crime was discovered, but his own explanation that he had walked part of the way seemed probable enough in view of the fineness of the night. He had actually arrived at twelve o'clock, and appeared to be overwhelmed by the unexpected tragedy. He had always been on good terms with his master. Several of the dead man's possessions - notably a small case of razors - had been found in the valet's boxes, but he explained that they had been presents from the deceased, and the housekeeper was able to corroborate the story. Mitton had been in Lucas's employment for three years. It was noticeable that Lucas did not take Mitton on the Continent with him. Sometimes he visited Paris for three months on end, but Mitton was left in charge of the Godolphin Street house. As to the housekeeper, she had heard nothing on the night of the crime. If her master had a visitor, he had himself admitted him. A discovery has just been made by the Parisian police [said the Daily Telegraph] which raises the veil which hung round the tragic fate of Mr Eduardo Lucas, who met his death by violence last Monday night at Godolphin Street, Westminster. Our readers will remember that the deceased gentleman was found stabbed in his room, and that some suspicion attached to his valet, but that the case broke down on an alibi. Yesterday a lady, who has been known as Mme Henri Fournaye, occupying a small villa in the Rue Austerlitz, was reported to the authorities by her servants as being insane. An examination showed that she had indeed developed mania of a dangerous and permanent form. On inquiry the police have discovered that Mme Henri Fournaye only returned from a journey to London on Tuesday last, and there is evidence to connect her with the crime at Westminster. A comparison of photographs has proved conclusively that M. Henri Fournaye and Eduardo Lucas were really one and the same person, and that the deceased had for some reason lived a double life in London and Paris. Mme Fournaye, who is of Creole origin, is of an extremely excitable nature, and has suffered in the past from attacks of jealousy which have amounted to frenzy. It is conjectured that it was in one of these that she committed the terrible crime which has caused such a sensation in London. Her movements upon the Monday night have not yet been traced, but it is undoubted that a woman answering to her description attracted much attention at Charing Cross Station on Tuesday morning by the wildness of her appearance and the violence of her gestures. It is probable, therefore, that the crime was either committed when insane, or that its immediate effect was to drive the unhappy woman out of her mind. At present she is unable to give any coherent account of the past, and the doctors hold out no hopes of the re-establishment of her reason. There is evidence that a woman, who might have been Mme Fournaye, was seen for some hours on Monday night watching the house in Godolphin Street. 'What do you think of that, Holmes?' I had read the account aloud to him, while he finished his breakfast. It was my first visit to the scene of the crime - a high, dingy, narrow-chested house, prim, formal, and solid, like the century which gave it birth. Lestrade's bulldog features gazed out at us from the front window, and he greeted us warmly when a big constable had opened the door and let us in. The room into which we were shown was that in which the crime had been committed, but no trace of it now remained, save an ugly, irregular stain upon the carpet. This carpet was a small square drugget in the centre of the room, surrounded by a broad expanse of beautiful, old- fashioned, wood flooring in square blocks, highly polished. Over the fireplace was a magnificent trophy of weapons, one of which had been used on that tragic night. In the window was a sumptuous writing-desk, and every detail of the apartment, the pictures, the rugs, and the hangings, all pointed to a taste which was luxurious and the verge of effeminacy. 'Seen the Paris news?' asked Lestrade. He took the corner of the carpet in his hand and, turning it over, he showed that it was indeed as he said. I could see from Holmes's rigid face that he was vibrating with inward excitement. 'By George, if he knows I'll have it out of him!' cried Lestrade. He darted into the hall, and a few moments later his bullying voice sounded from the back room. 'Now, Watson, now!' cried Holmes, with frenzied eagerness. All the demoniacal force of the man masked behind that listless manner burst out in a paroxysm of energy. He tore the drugget from the floor, and in an instant was down on his hands and knees clawing at each of the squares of wood beneath it. One turned sideways as he dug his nails into the edge of it. It hinged back like the lid of a box. A small black cavity opened beneath it. 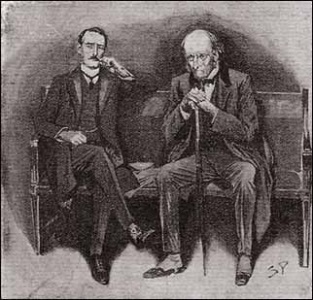 Holmes plunged his eager hand into it, and drew it out with a bitter snarl of anger and disappointment. It was empty. 'Quick, Watson, quick! Get it back again!' The wooden lid was replaced, and the drugget had only just been drawn straight, when Lestrade's voice was heard in the passage. 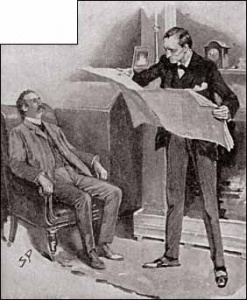 He found Holmes leaning languidly against the mantelpiece, resigned and patient, endeavouring to conceal his irrepressible yawns. As we left the house Lestrade remained in the front room, while the repentant constable opened the door to let us out. Holmes turned on the step and held up something in his hand. The constable stared intently. 'You have solved it!' I cried. When we arrived at the residence of the European Secretary it was for Lady Hilda Trelawney Hope that Sherlock Holmes inquired. We were shown into the morning-room. The lady sprang to her feet, with the colour all dashed in an instant from her beautiful face. Her eyes glazed - she tottered	I thought that she would faint. Then with a grand effort she rallied from the shock, and a supreme astonishment and indignation chased every other expression from her features. 'Come, come, madam, it is useless. Give up the letter.' She darted to the bell. She stood grandly defiant, a queenly figure, her eyes fixed upon his as if she would read his very soul. Her hand was on the bell, but she had forborne to ring it. She stared at him with an ashen face, and gulped twice before she could speak. 'You are mad, Mr Holmes - you are mad!' she cried at last. She gave a gasp, and her head dropped back in her chair. The butler had hardly closed the door behind him when Lady Hilda was down on her knees at Holmes's feet, her hands outstretched, her beautiful face upturned and wet with her tears. She darted across to a writing-desk, unlocked it, and drew out a long blue envelope. A moment later she had appeared with a red flat box in her hand. From out of her bosom Lady Hilda had drawn a small key. The box flew open. It was stuffed with papers. Holmes thrust the blue envelope deep down into the heart of them, between the leaves of some other document. The box was shut, locked, and returned to his bedroom. 'I tapped at the door, as agreed. Lucas opened it. I followed him into his room, leaving the hall door ajar behind me, for I feared to be alone with the man. I remember that there was a woman outside as I entered. Our business was soon done. He had my letter on his desk; I handed him the document. He gave me the letter. At this instant there was a sound at the door. There were steps in the passage. Lucas quickly turned back the drugget, thrust the document into some hiding-place there, and covered it over. 'What happened after that is like some fearful dream. I have a vision of a dark, frantic face, of a woman's voice, which screamed in French, "My waiting is not in vain. At last, at last I have found you with her!" There was a savage struggle. I saw him with a chair in his hand, a knife gleamed in hers. I rushed from the horrible scene, ran from the house and only next morning in the paper did I learn the dreadful result. That night I was happy, for I had my letter, and I had not seen yet what the future would bring. The European Secretary burst excitedly into the room. 'Any news, Mr Holmes, any news?' he cried. The Prime Minister's manner was subdued, but I could see by the gleam of his eyes and the twitchings of his bony hands that he shared the excitement of his young colleague. 'I cannot believe my eyes!' He ran wildly to the door. 'Where is my wife! I must tell her that all is well. Hilda! Hilda!' we heard his voice on the stairs. Holmes turned away smiling from the keen scrutiny of those wonderful eyes. 'We also have our diplomatic secrets,' said he, and picking up his hat he turned to the door. This page was last edited on 6 February 2019, at 23:36.